Manson was a career criminal, who, in the 1960s—an era in which communes and non-conventional living arrangements were common—led a group he called “the Family” and also known as the “Manson Family.” On August 8, 1969, Manson masterminded the singularly bloody murders of Sharon Tate (pregnant actress wife of movie director Roman Polanski) and four others in the Tate-Polanski Beverly Hills home. On August 9, the Manson Family similarly slaughtered Leno and Rosemary La Bianca in their Los Angeles home. Manson and his “family” were soon captured. 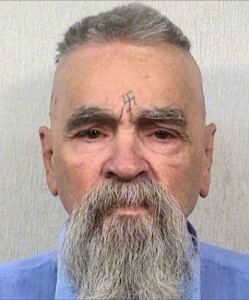 Identified as the instigator and planner of the murders, Manson was sentenced to life imprisonment. He came to symbolize the darkest aspects of freewheeling 1960s counterculture and entered the pantheon of American pop culture as the incarnation of senseless but elemental evil.